I have a friend who enjoys wine and is planning to travel to France next year. 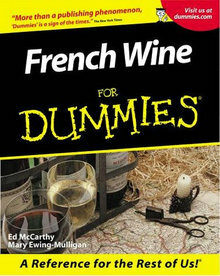 I'd like to buy them a practical guide book to French Wine Regions. Is there a Lonely Planet style book or anything that you can recommend? so I wouldn't recommend it. I don't think that the Lonely Planet has a specific guide. There is a Michelin Green Guide Wine Regions of France. I just looked it up on Amazon, where you can do a search inside... there are 15 entries for Madiran in the index so it goes beyond the main appellations in it's coverage. I've not seen the physical book but it looks OK online...perhaps for more advanced winelovers or those who will be travelling extensively. If your friend is just a beginner maybe something more basic would be more suitable. The "For Dummies" series of books are usually very well written, but giving them as a gift could carry a certain connotation. Or perhaps you can find something else at in the extensive collection of French wine guides at cookbooks.com.au. The Eyewitness companions series by Dorning Kindersley are always colourful and very informative. Anyone else like to contribute... have you used this green guide or have you another suggestion?